The hotel Vista Palace, situated in Roquebrune-Cap-Martin, perched at 300 metres above the bay of Monte Carlo, is a luxury hotel fully air conditioned, offering one of the most spectular views overlooking the Italian Riviera to the East and Monaco to the West. The hotel is surrounded by a large garden with outdoor swimming pool. Gourmet restaurant and summer restaurant are the region's culinary highlights. In the bar Lounge Icare, guest can enjoy cocktails and one of the world's most magnificent views. A special feature of the hotel is the wellness centre, which has been created to provide relax and benefit from saunas, solarium, massages and body care treatments. 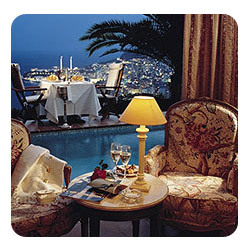 hotelsmonaco.net is a online accommodation reservation website dedicated to Monte Carlo and surrundings - we have every kind of lodging including budget accommodations , discount hotel rooms, and luxury 5-star hotels. Our goal is to offer the widest choice. We also offer a convenient, fast and secure way to make a booking. We hope that you will find the right accommodation to meet your travel plans. Enjoy your stay in Monte Carlo.